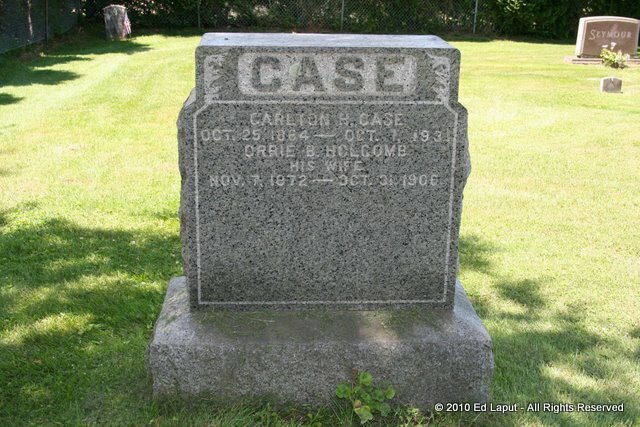 Carlton Henry Case was born on 25 October 1864 at Granby, Hartford Co., CT. He was the son of Hector Case and Caroline Bingham Osborn. Carlton Henry Case married Martha Morse. Carlton Henry Case married Orrie Bell Holcombe, daughter of Oliver Leggett Holcombe and Annis Samantha Griffin, on 30 August 1890 at New York City, NY. Carlton Henry Case died on 1 October 1931 at age 66. He was buried at Copper Hill Cemetery, East Granby, Hartford Co., CT.
Carleton is recorded in the 1900 Granby census as a carpenter, age 35 with wife Orrie B. and daughters Mertie C. and Nellie C.
[S101] Ruth Cost Duncan, John Case, Page 150/Item 427, with additions. Martha Morse was born at Southwick, Hampden Co., MA. She married Carlton Henry Case, son of Hector Case and Caroline Bingham Osborn. Martha Morse died in 1890 at Simsbury, Hartford Co., CT.
Maude L. Lauzon was born on 9 June 1896 at Suffield, Hartford Co., CT.1,2 She was the daughter of Fredrick Lauzon and Ella Agusta Holcombe. Maude L. Lauzon married Burton King Holcombe, son of Charles Joseph Holcombe and Edith Sarah King, on 17 August 1916 at West Suffield, Hartford Co., CT.2 Maude L. Lauzon died on 1 December 1995 at Nursing Home, West Suffield, Hartford Co., CT, at age 99.1,2 Courant obituary 12/04/1995. [S182] Social Security Death Index (on-line), Ancestry.com, SSDI, Ancestry.com, SSAN 049-36-2210. Madeleine (Holcomb) Colson, 86, of West Suffield, wife of the late Howard A. Colson died peacefully on Thursday, (February 12, 2004) at St. Francis Hospital. She was born in Hartford, the daughter of the late Burton and Maude (Lauzon) Holcomb. A lifelong resident of West Suffield, she was a graduate of Suffield Academy. She is survived by her son and daughter-in- law, Dennis and Linda Colson of West Suffield; a son-in-law, Robert Jones of Burke, VA; four grandchildren, Rod Colson of Colchester, Darryl Colson of West Suffield, Jennifer Crider and her husband Kevin of Forest, VA, and Kimberly Williams and her husband Ron of Wilmington, DE; and four great grandchildren. She was predeceased by her daughter, Joyce Jones and her brother, Kenneth Holcomb. Funeral services and burial will be private at the convenience of her family. Memorial donations may be made to the Emergency Aid Association, 450 South St., Suffield, CT 06078 or a charity of the donor's choice. Nicholson & Carmon Funeral Home has care of arrangements. [S180] Compiled by Richard C. Roberts, Roberts Reunion, Page 34/Item A42. [S284] Courant, February 14, 2004. Wallis Gleason was born on 2 August 1788 at Roxbury, Delaware Co., NY. He was the son of James Gleason and Lovina Drake. Wallis Gleason married Elspeth Daniel. Wallis Gleason died on 25 October 1839 at Van Buren, IA, at age 51. Kenneth Raymond Holcombe was born on 18 April 1929 at West Suffield, Hartford Co., CT. He was the son of Burton King Holcombe and Maude L. Lauzon. [S180] Compiled by Richard C. Roberts, Roberts Reunion, Page 34/Item A43. Died young, scalded by boiling water. Hepzibah Barber was the daughter of Jesse Barber and Hepzibah Humphrey. Achsah Barber was born on 25 January 1793. She was the daughter of Jesse Barber and Hepzibah Humphrey. Achsah Barber died on 1 September 1884 at Swanton, Franklin Co., VT, at age 91. Giles Barber was born on 2 December 1795. He was the son of Jesse Barber and Hepzibah Humphrey. Giles Barber died in 1883. Theda Barber was born between 19 October 1797 and 1798 at Fairfield, VT. She was the daughter of Jesse Barber and Hepzibah Humphrey. Theda Barber married Joseph Sumner Jennison, son of William Jennison and Sarah Sumner, on 8 March 1819. Theda Barber died on 6 June 1889 at Howard Co., IA. Laura Barber was born in 1800. She was the daughter of Jesse Barber and Hepzibah Humphrey. Laura Barber married Watson Noble, son of Eli Noble and Eunice Wilcox, in 1820. Laura Barber died on 10 June 1863. Information on Theophilus and his descendants is from Holly Lorraine McKenzie; voila@netcom.ca who got most of it from Don Barber, author of Barber Genealogy donbarber@aol.com. Theophilus Barber was born on 22 April 1803 at probably Canton, CT. He was the son of Jesse Barber and Hepzibah Humphrey. Theophilus Barber married Amanda Warner, daughter of Isaac Warner and Experience Allen, on 3 May 1829. Theophilus Barber died on 10 November 1879 at Swanton, Franklin Co., VT, at age 76. [S169] M.D. Donald S. Barber, Thomas Barber 1st Ed, Pages 71,151/Item 177. Information on Jesse and his descendants is from Holly Lorraine McKenzie; voila@netcom.ca who got most of it from Don Barber, author of Barber Genealogy donbarber@aol.com. Jesse Barber was born on 23 October 1806 at Swanton, Franklin Co., VT. He was the son of Jesse Barber and Hepzibah Humphrey. Jesse Barber died on 3 June 1884 at St. Albans, Franklin Co., VT, at age 77. [S169] M.D. Donald S. Barber, Thomas Barber 1st Ed, Page 152/Item 178. Diana Barber was born on 2 February 1810. She was the daughter of Jesse Barber and Hepzibah Humphrey. Diana Barber died in 1871 at Warden, Quebec, Canada. George B. Foster was the son of John S. Foster and Hepzibah R. Barber. George was a merchant at St. Albans, VT.
[S169] M.D. Donald S. Barber, Thomas Barber 1st Ed, Page 151. Amanda Warner was born on 9 April 1808 at Swanton, Franklin Co., VT. She was the daughter of Isaac Warner and Experience Allen. Amanda Warner married Theophilus Barber, son of Jesse Barber and Hepzibah Humphrey, on 3 May 1829. Amanda Warner died on 31 January 1888 at Swanton, Franklin Co., VT, at age 79. Information is from The Phelps Family News, Volume 12, No. 8, January 1999; provided by Nadia P. Smith, 877 Mallard Ave., Boone, IA 50036. Timothy Phelps was born on 3 February 1713/14 at Windsor, Hartford Co., CT.1 He was the son of Cornelius Phelps and Sarah Mansfield. Timothy Phelps married Margaret Gillette, daughter of Daniel Gillett and Mary Eno, on 24 April 1746 at Windsor, Hartford Co., CT. Timothy Phelps died in February 1794 at Windsor, Hartford Co., CT.
Margaret Gillette was born on 31 December 1723 at Windsor, Hartford Co., CT. She was the daughter of Daniel Gillett and Mary Eno. Margaret Gillette married Timothy Phelps, son of Cornelius Phelps and Sarah Mansfield, on 24 April 1746 at Windsor, Hartford Co., CT.
[S52] Henry R. Stiles History of Ancient Windsor II, Vol. II:Pg. 290/Family 9. Flavia Ann Barber was the daughter of Giles Barber and Mary Garrett. Flavia Ann Barber married Anson Wheeler, son of Nathan Wheeler and Mary Doolittle, in 1822 at Canton, Hartford Co., CT. Flavia Ann Barber died in 1858. Jesse Lysander Barber was born in 1797 at probably Canton, CT. He was the son of Giles Barber and Mary Garrett. Jesse Lysander Barber married Melissa Andrus, daughter of Philemon Andrus and Phebe Case, on 18 November 1819. Jesse Lysander Barber died on 10 September 1845 at Canton, Hartford Co., CT.
[S169] M.D. Donald S. Barber, Thomas Barber 1st Ed, Pages 71,152/Item 179. Mary Barber was born on 5 June 1803. She was the daughter of Giles Barber and Mary Garrett. Mary Barber married Noah Russell Lyman Bristol, son of Philo Riggs Bristol and Nabby Lyman, on 1 January 1829 at Canton, Hartford Co., CT. Mary Barber died on 4 September 1887 at age 84. [S169] M.D. Donald S. Barber, Thomas Barber 1st Ed, Page 72. Volney G. Barber was born in 1805 at Canton, Hartford Co., CT. He was the son of Giles Barber and Mary Garrett. Volney G. Barber died on 18 January 1859 at Bristol, Hartford Co., CT.
[S169] M.D. Donald S. Barber, Thomas Barber 1st Ed, Page 153/Item 180. Quincy Barber was born in 1809. He was the son of Giles Barber and Mary Garrett. Quincy Barber died on 18 February 1826. Lucian Barber was also known as Lucian Barbour. He was born on 4 March 1811 at Canton, Hartford Co., CT. He was the son of Giles Barber and Mary Garrett. Lucian Barber married Alice Thomas Barbee on 11 October 1842. Lucian Barber died on 19 July 1880 at age 69. Julia Maria Barber was born on 3 May 1807 at Canton Center, CT. She was the daughter of Giles Barber and Mary Garrett. Julia Maria Barber married Ezekiel Thrall Case, son of Japhet Case and Chloe Thrall, on 8 July 1832 at Canton Center, CT. Julia Maria Barber died on 19 November 1886 at Sutton, NE, at age 79. [S59] Ruth Cost Duncan, John Case, Page 107/Item 269m. Ezekiel Thrall Case was born Decmeber 12, 1806 at Barkhamsted, Litchfield Co., CT. He was the son of Japhet Case and Chloe Thrall. Ezekiel Thrall Case married Julia Maria Barber, daughter of Giles Barber and Mary Garrett, on 8 July 1832 at Canton Center, CT. Ezekiel Thrall Case died on 12 October 1872 at Baton Rouge, Baton Rouge Co, LA. [S101] Ruth Cost Duncan, John Case, Page 107/Item 269. Information from Family Group Sheet from Diane Graham, 3912 5th Ave., Sioux City, IA 51106. Didama Hanna Barber was born on 2 March 1813 at Canton, Hartford Co., CT. She was the daughter of Giles Barber and Mary Garrett. Didama Hanna Barber married Hon. Selden White, son of Friend White Jr. and Roxanna Hamlin, on 30 August 1836 at Canton, Hartford Co., CT. Didama Hanna Barber died in 1902. [S169] M.D. Donald S. Barber, Thomas Barber 1st Ed, Page 73. Dryden Barber was born on 4 April 1815 at Canton, Hartford Co., CT. He was the son of Giles Barber and Mary Garrett. Dryden Barber married Keturah Ann Barber, daughter of Daniel Barber and Anna Betts, on 25 June 1837. Dryden Barber married Jane Wilcox, daughter of Zaccheus Wilcox and Temperance Case, on 16 March 1843. Dryden Barber died on 21 December 1896 at age 81. History of Tama County, Iowa. Springfield, Ill., Union Publishing Company, 1883. Page 861. Dryden Barbour came to Tama county, in 1858. He was born in Canton, Hartford county, Connecticut, April 4, 1815. He spent his early years on his father’s farm, in the district school, and in his brother’s shoe shop, until, at the age of 19, he went to the State of Alabama in the capacity of a Yankee clock peddler. He continued in that business for seven or eight years, in Alabama, Pennsylvania and Ohio, then he returned to Connecticut, and was married to Miss Jane Wilcox, March 16, 1843, who was also a native of Canton. He bought a farm and remained in his native town six years. In 1849, Mr. Barbour moved to Wakeman, Huron county, Ohio, where he remained nine years. In the spring of 1858, he sold out in Ohio, and moved to Tama county, Iowa. In 1861, he bought the southeast quarter of section 11, in Perry township, one mile east of Traer, where he still resides with his son Henry, who carries on the farm. Mr. Barbour was the father of six children, three of whom, together with their mother, have passed away. Dryden and Jane Barber were enumerated in the 1850 Wakeman, Huron Co., OH, federal census. He was a farmer, age 35, she was 34. Children in the household were Alice 5, Hiram 4, and Flavia 2. Dryden and Jane were enumerated in the 1870 Perry, Tama Co., OH, federal census. He was a farmer, age 55, she was 54. Children in the household were Henry 19, and a son 16. Dryden and Jane "Barbour" were enumerated in the 1880 Perry, Tama Co., OH, federal censu. He was a farmer, age 64, she was 63. Children in the household were Henry 30, his wife Mary 26, their children Alice 4 and Lucian 2. [S169] M.D. Donald S. Barber, Thomas Barber 1st Ed, Page 154/Item 181. Sylvester L. Hubbard was born on 29 August 1818 at Haddam, Middlesex Co., CT. He married Helena Gleason, daughter of Wallis Gleason and Elspeth Daniel, in December 1840 at Van Buren Co., IA. Sylvester L. Hubbard died on 2 October 1870 at Colusa Co., CA, at age 52. [S336] Ancestry.com, Ancestry.com. Web: Missouri, Death Certificates, 1910-1962 [database on-line]. Provo, UT, USA: Ancestry.com Operations, Inc., 2015. Missouri Death Certificates. Missouri Secretary of State. http://www.sos.mo.gov/records/archives/archivesdb/… accessed 24 August 2014. Lina Barber married Dudley Case, son of Capt. Elias Case and Lucretia Foote. Lina Barber was the daughter of Giles Barber and Mary Garrett. Lina Barber died in 1848 at Barkhamsted, Litchfield Co., CT.
Dudley Case married Lina Barber, daughter of Giles Barber and Mary Garrett. Dudley Case was born on 6 July 1787 at Canton, Hartford Co., CT. He was the son of Capt. Elias Case and Lucretia Foote. Dudley Case died on 13 August 1852 at Texas at age 65. [S101] Ruth Cost Duncan, John Case, Page 98/Item 234. Lucretia Foote married Capt. Elias Case, son of Lt. Dudley Case and Dorcas Humphrey, in 1780 at Simsbury, Hartford Co., CT. Lucretia Foote married Capt. Dudley Case, son of Lt. Dudley Case and Dorcas Humphrey. [S59] Ruth Cost Duncan, John Case, Page 53. [S275] Frederick Humphreys, Humphreys, Page 462. Coryden Barber was born in 1799. He was the son of Giles Barber and Mary Garrett. Coryden Barber died in 1803. Hon. Selden White was born in 1809. He was the son of Friend White Jr. and Roxanna Hamlin. Hon. Selden White married Didama Hanna Barber, daughter of Giles Barber and Mary Garrett, on 30 August 1836 at Canton, Hartford Co., CT. Hon. Selden White died in 1868. Martha White was born on 8 November 1839. She was the daughter of Hon. Selden White and Didama Hanna Barber. Martha White married Edwin R. Pierce on 17 December 1856. Resided at Warren PA and in Iowa. Edwin R. Pierce married Martha White, daughter of Hon. Selden White and Didama Hanna Barber, on 17 December 1856. Phillp Dryden White was born on 15 January 1838. He was the son of Hon. Selden White and Didama Hanna Barber. Phillp Dryden White died December 28, 1866, unmarried. Information from Family Group Sheet from Diane Graham, 3912 5th Ave., Sioux City, IA 51106. Willard White was born on 23 May 1843 at Canton Center, CT. He was the son of Hon. Selden White and Didama Hanna Barber. Willard White was born on 30 May 1844.1 He married Emma Frances Nightingale, daughter of James White Nightengale and Mary Frances Folsom, on 21 June 1876. Willard White died on 17 May 1923 at Portland, Multnomah Co., OR, at age 79. Emma Frances Nightingale was born on 21 June 1846 at Boston, Suffolk Co., MA. She was the daughter of James White Nightengale and Mary Frances Folsom. Emma Frances Nightingale married Willard White, son of Hon. Selden White and Didama Hanna Barber, on 21 June 1876. Emma Frances Nightingale died on 20 August 1912 at Boise, Ada Co., ID, at age 66.